Despite the growing purchasing power of college students, recent survey results released by education consultancy Eduventures reveal that more than half (52 percent) of the students surveyed spend less than $250 of their own money on technology or electronic purchases each year. 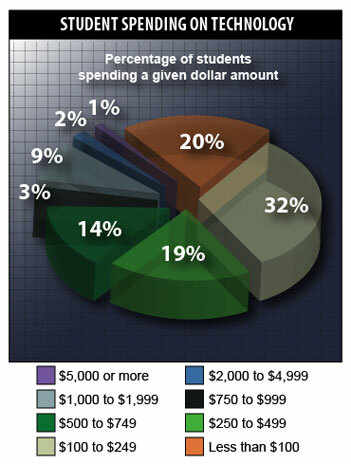 With a small minority of students (3 percent) spending more than $2,000 of their own money on technology and electronics each year, it is clear that the independent purchasing power of college students on technology has either been overstated or that students still rely on other sources, namely parents, to fund their technology lifestyle. More than half of the college students surveyed reported spending less than $250 of their own money on technology/electronic purchases each year. Source: Eduventures. The information presented here is based on a Web survey by Eduventures of 18- to 24-year-old students enrolled full-time at a four-year college or university. Laurence Bloom is a custom research manager at Eduventures, an education consultancy and research firm based in Boston.